Prime Minister Janet Jagan presenting the late President Jagan's Standard to Chief-of-Staff Joe Singh yesterday. Looking on are Ministers Bisnauth and Fung-On. The presention of the Standard of the late President Cheddi Jagan to Head of the joint services Brigadair Joe Singh was described as the "last of the series of acts that concluded the stewardship of the late President". The Standard of the President which was handed over by his wife, who is also Prime Minister of Guyana, Mrs Janet Jagan, will be placed in the Guyana Defence Force (GDF) museum. Brigadier Singh in receiving the Standard said that he did so with honour. He then handed it to Major Enoch Gaskin of GDF with an order to ensure that it was placed in the museum. The Standard, a personal flag of the President, has an emblem comprising a representation of a Harpy Eagle with wings spread, standing over plantains, two eddoes, and two roots of cassava which in turn are flanked on the right by a sheaf of rice and on the left by a stalk of sugar cane. Superimposed on the eagle's centre is a mechanical gear-wheel with twelve teeth, which envelops a factory and its four chimneys spouting smoke with the rising sun in the background. The background comprises five horizonal panels, the outermost of which is gold in colour, the central one red and the others green. This Standard replaced the previous one by the command of President Samuel Hinds on behalf of the late President Jagan. Mrs Jagan explaining the symbolism of the Standard, said the Harpy Eagle which dominates the Standard, represented strength and reliability, qualities associated with the late President. She noted that Guyana is one of the main areas in this region that is home to this endangered species. The produce and chimneys represented the late President's emphasis on a strong agricultural base, and the importance he attached to industry and technology. The rising sun in the background symbolized the dawning of a new era which he had made possible, while the three colours, red, green and gold, represented the national flag of Guyana of which President Jagan had always been extremely proud. The Prime Minister disclosed that although the late President had not been involved in the finer details of design, the Standard had, nevertheless, been prepared under his guidance. She said that the Standard which was designed by local artist Jimmy Simmons should have been presented to the late President a couple of months before he died; however, a few setbacks prevented this. The 27-year-old artist who is a graphic designer said that he was honoured to design the Standard for the late President, although he was sad that it had not been completed before the Dr Jagan died. The Standard is to be displayed in the GDF museum, however if Dr. Jagan was alive the Standard would have been flown wherever the President was present. Head of the Presidential Secretariat Dr Roger Luncheon told the small gathering which included the son and daughter of the late President Nadira Jagan-Brancier, Dr Cheddi Jagan Jnr, Head of the Guyana Police Force (GPF) Laurie Lewis, Head of the Prison Service Cecil Kilkenny, Director of the Guyana National Service Colonel Clifford Klass and Head of the Guyana Fire Service Tulsi John and several Minister of the Government that had Dr Jagan been alive the presentation of the Standard would have been a more ceremonial occasion. According to Album 2000 [pay00] - President of the Republic (1:1) - Square banner of arms. Colouring is based on [smi82]. However, the bird does look quite simplified here. I fear we've somehow mismatched the structure and the content of that page a bit: Both the content of the overview and the last section appear to be on President Jagan's Flag. The only general bit is probably Jan Oskar's question about the relation between the Presidential Flag and the President Standards of the individual presidents. And now that I mention it: Does anyone know? What is the relation between the Presidential Flag of Guyana and the President Standards of its individual presidents? The former image is based on the simplified image of the Coat-of-Arms of Guyana, which shows a rather simplified image of the Canje Pheasant-the national bird. The images of the Presidential Flag in publications housed at the National Archives show a detailed image of the Victoria Regia Lily and Canje Pheasant on the Presidential Flag. When Guyana became a Republic in 1970, the Presidential Standard (the square banner of the Arms with the smaller green shield bearing the Cacique Crown) was not regulated by legislation, it was regulated by a Proclamation on the 23rd of February, 1970 (Republic Day) relating to the Presidential Standard, Presidential Arms and Great Seal. There is no separate 'Presidential Flag of Guyana' and 'individual Presidential Standards'. There is just the 'Presidential Standard of Guyana and Yes the Presidential Standard of Guyana can be changed by Presidential Proclamation amending the original Proclamation of the 23rd of February, 1970 by substituting whatever design is contained in that Proclamation to the design the President wants to reflect as either the new Presidential Standard or the Presidential Standard of another President during that President's term in office. This is a fringed version of the national flag. The colors are more darker/profound (the gold arrowhead of the flag). I say this may be the current Presidential Standard since based on pictures I have seen, this flag is hoisted is present on the President's arrival at official and military functions. Apparently the Presidential Standard could change with each president. I was not able to locate a proclamation by President Jagdeo amending the Proclamation of the 23rd of February, 1970 to reflect a change in the Presidential Standard different from that of President Janet Jagan. However as I have noted above, it appears that President Jagdeo uses a fringed version of the national flag with more profound colors. I once saw a picture of the personal flag of LFS Burnham- President of Guyana from 1980-1985. I have recreated an image based on my memory of that picture. I saw the picture when I lived in Guyana. I had visited Parliament Library one day and I saw it in an informational public booklet published at that time during his presidency. 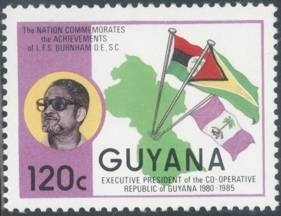 This flag appeared on a stamp issued in Guyana. In 1980, the Constitution was changed to provide for an Executive President and Prime Minister L.F.S. Burnham became the first Executive President on the 6th of October, 1980. On that day he issued Proclamation No. 3 of 1980 under the Great Seal of the Republic amending the Proclamation of the 23rd of February, 1970 by altering the design of the Presidential Standard (the banner of arms) replacing it with the Purple and White flag with the Coconut Palm and Black Caiman emblem. The proportions of this new flag was 3:4. Thus after the issuance of this Proclamation of the 6th of October, 1980, the Banner of Arms ceased to be the Presidential Standard. I am not sure whether President Desmond Hoyte who became president after the death of L.F.S. Burnham in 1985 changed the Presidential Standard as I did not manage to come across any Proclamation of that nature, due to time constraints among other logistical factors (although looking at the precedence which follows for subsequent Presidents I would not be surprised if Hoyte changed the Presidential Standard by further amending the Proclamation of the 23rd of February, 1970 which now reflected the Burnham Presidential Standard). I am cataloguing the former flag collection of the State Library-Museum of Victoria, which has been donated to our Society. Amongst the flags, so far inspected was this attached flag, which was labelled with a sticky post-it note, "GUYANA (State Arms)". This flag was donated to the State Library-Museum of Victoria in 1992. The two Jaguars, all be it reversed, are identical to those in the Guyana's Arms, and appear in the opposite order on the flag's reverse. The central Palm Tree is similar to the Palm Tree that appears on the then flag of the governing political party, Peoples National Congress (PNC). After discussing this with a Flags Australia colleague, it was suggested to me that it may possibly be the Presidential Flag for Guyana's President Hugh Desmond Hoyte (1985-1992). Another possibility, but less likely, is that it could even be the Prime Minister's Flag, who at the this time was Hamilton Green, who also served between 1985-1992. The flag itself measures 96 cm (3 feet, 2 inches approx.) high by 162 cm (5 feet, 3 inches approx.) long, plus the heading. The central vertical black stripe and arms are painted onto both sides of the flag's yellow field material. I can confirm that this is the Presidential Standard used by President Desmond Hoyte. I had seen this flag at when I went to Guyana, however I was unsure since I could not find the Proclamation relating to the flag and the image I saw was the design used on the back cover of a memorial booklet for Mr. Hoyte. This image was oval in shape and as such I did not want to make the pronouncement that it was his flag. However thanks to Mr. Bartlett's image I can now safely make that pronouncement. 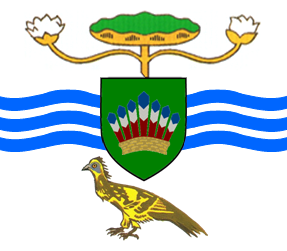 This is the Presidential Standard of Dr. Cheddi B. Jagan (President of Guyana from 1992-1997). This drawing is based on the description above (with the source listed as the Stabroek News) and a partial picture of the flag on display at the Cheddi Jagan Research Center in Guyana. Stabroek news on-line is at <http://www.stabroeknews.com>. 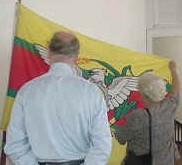 The entire picture, that partially shows the flag, is at <http://jagan.org/cjcentre3.htm> of the Cheddi Jagan Research Centre. As noted in a separate entry above from the Stabroek News, President Cheddi Jagan died in March 1997 before his Presidential Standard was put into use. I would not be surprised if the 'command' by President Samuel Hinds mentioned in the article from the Stabroek News actually refers to a Proclamation by President Hinds changing the Presidential Standard (and dating its usage so that it corresponds with the tenure of President Cheddi Jagan, which is permissible) to reflect the Presidential standard that would have been used by President Cheddi Jagan. From the partial picture linked in this page the proportions of this flag appears to be 3:5, although it could be 1:2. President Samuel Hinds who became President after the death of President Cheddi Jagan issued Proclamation No. 1 of 1997 under the Great Seal of the Republic on the 19th of December, 1997 (his last day in office) amending the Proclamation of the 23rd of February, 1970 and changing the Presidential Standard to his design during his tenure. (I have the description of this Presidential Standard, however I must do more research in order to present an accurate re-creation of the image). The proportion of this flag was 1:2. President Janet Jagan was elected President on the 19th of December 1997, and used a variation of her husband's (President Cheddi Jagan) Presidential Standard by moving the 12 pointed gear wheel with its factory and sun motifs from the center of the Harpy Eagle to the Harpy Eagle's right, and added the Amerindian symbol for 'Woman' to the Harpy Eagle's left. It did not seem that she thought of or had time issuing a Proclamation to that effect since President Bharrat Jagdeo who became President after President Janet Jagan resigned in August 1999 issued Proclamation No. 5 of 2001 amending the Proclamation of the 23rd of February, 1970 by changing the description of the Presidential Standard to reflect President Janet Jagan's design and dating it's usage to her tenure in office. The proportions of this flag was 1:2.